The hotel has 35 guestrooms and suites total. Landgraf Hotel & Loft offers modern 4 star accommodation in a stylish and welcoming atmosphere, suitable for both business and tourist travelers to Linz - the main city of Upper Austria. It is housed in a remarkable neo-Gothic building, considered an architectural monument itself and ideally situated in the Urfahr district on the left bank of the Danube River, just across the Nibelungen Bridge (Nibelungenbrücke) from the romantic old town with its worth-seeing main square - Hauptplatz, the old castle - Linzer Schloss, dating back to the time of Charlemagne, the two cathedral churches (old and new), the Old City Hall and many other medieval, renaissance and baroque architectural monuments. This attractive design hotel is close to the New City Hall (Neues Rathaus), the Ars Electronica Center and the Modern Art Museum Lentos. The Urfahr Train Station is just 400 m away, while in a radius of 100-200 m from the hotel you will find several bus and tram stops with regular public transport lines to the more distant points of interest, including the Stadium and the TipsArena sports centre, the Linz Design Center, the central train station (Hauptbahnhof) and the international airport. Convenient public transport is available to the nearby Pöstlingberg Hill too, where you can admire inspiring views over the city and see the impressive Pilgrimage Basilica (Wallfahrtsbasilika) adorned its top. Here is located the famous Grottenbahn amusement park too. The city centre design hotel Landgraf & Loft in Linz is an excellent accommodation choice not only for its prime location. Inside the pretty neo-Gothic building you will find cordial Austrian hospitality, elegantly decorated interiors and top quality of modern 4-star service. It has its own restaurant, serving delicious Austrian and European cuisine in a cozy and inviting salon. The on-site Landgraf Café is the ideal place to unwind with a cup of aromatic coffee and chat with friends. It is a popular meeting place even among the locals and serves a variety of drinks, professionally prepared cocktails and light meals. Complimentary Internet access via Wi-Fi network is available in all rooms and common spaces. Other service include elevator, heating, luggage deposit room, laundry and dry cleaning, meeting facilities and private car parking (€12.00 per day). 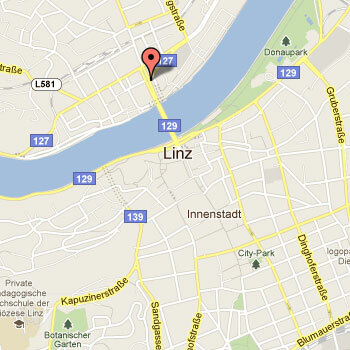 The design Hotel Landgraf in Linz Urfahr has 35 guestrooms and suites. All accommodations are furnished and decorated in an individual modern style, featuring spacious interiors (standard double rooms are 28 square meters in size) and interesting paintings by local Austrian artists. The elegant wooden furnishings and the tasteful décor in warm colors make hotel rooms and suites even more cozy and inviting. All of them have seating area, writing desk, free Wi-fi Internet, telephone, cable TV, private bathroom with shower, bathroom amenities, bathrobes, mini bar and heating.